Today I am very excited to introduce you all to Spectral by Shannon Duffy by being a part of the blog tour. I have been excited to share this book with all of you since I finished it. I really loved the world that Shannon Duffy created. I think she made her mark for being a debut author. I hope you all enjoy my review and add this book to your to be read list. Thank you Tribute books for having me on this tour. I was excited when i got the request and now that I have read the book I am even more excited to be a part of this tour. Everyone please give a warm welcome to Tribute books, everything I have read by them has been fantastic. Without further ado, the reason you are reading this post, give another warm welcome to Spectral. Jewel had moved her entire life, being told that her family was in the witness protection program and bad people were after her dad. After their last move, she discovered things were not what they seemed. She met Roman, who started school the day after her and seemed to know more about her and her family than she did herself. 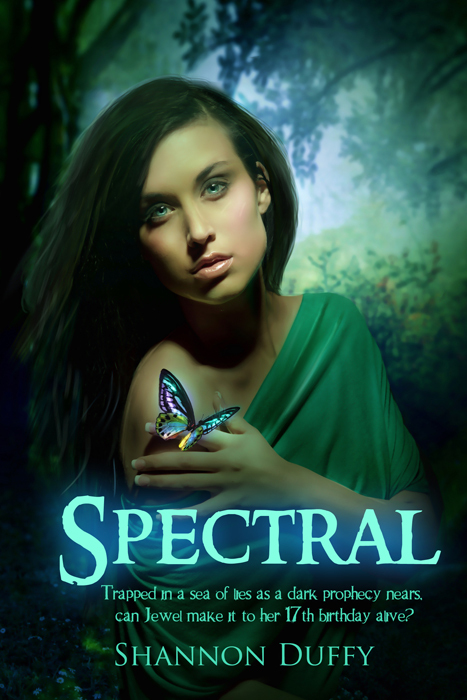 She discovered she was something called a Spectral, which was a very unique, powerful witch. Roman told her that he was there to protect her, but she didn’t know who to trust or believe anymore. The more time she spent with Roman, the more she was drawn to him, while, at the same time, another guy named Chase fought for her attention.impressed. It was not what I expected at all! Not only was the plot interesting, but also, surprising in some parts. The book was darker than I expected, which I liked. It wasn't super dark, but the main scheme of things was much more intriguing than Jewel just finding out she has powers, learning how to use them, and everything turning out fine. There is a ton of bad she must go through first, but the good and the bad balance out nicely. The plot, characters, and action kept me very interested until I finished the novel. The characters were relatable and memorable. It was easy for me to put myself in Jewel’s place, not that I’m a super powerful witch or anything, but in the sense of putting myself into an awesome fantasy story. There were also two great guys in this book, but, of course, I personally fell for the darker bad boy, Roman. He was also a part of her new world, but he also wasn’t supposed to date her. Oh, forbidden love, it is always the best. I liked Chase a lot also; he was super sweet, respectful, and there for Jewel when she needed it. This debut author did a great job keeping the story interesting and connecting everything really well. I got to know the world and characters on a level that made them feel very real to me. The author’s writing style flowed nicely, making it a very enjoyable, fast-paced read. I look forward to reading more of the author's work when she comes out with new books. I could see this turning into a series and would love to read more of Jewel’s story. No Really, Buy this book NOW! Thank you very much love! any time I always love sharing my love of books with you!